So, we're trying to make a major return for the new year, with a new podcast episode getting recorded next week, several videos ready to go up and a new thing that I aim to put up once a week, the tales of Dark Heresy. You see, the Mages Guild, the university organization I am in charge of that put on the charity event run on this site in November, is also running a weekly RPG campaign of the Fantasy Flight Games RPG "Dark Heresy." 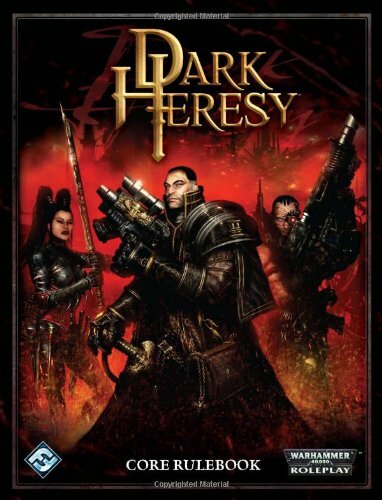 For those of you unfamiliar with this game it is an RPG that takes place in the Grim Dark universe of the 41st millennium that Warhammer 40k takes place in. The players are acolytes working in the service of a holy Inquisitor hunting out heresy, daemons, and xenos from normal "Imperial" society. Unlike Dungeons and Dragons this game is percentile based, meaning that all tests and such are rolled on a D100 or two D10's. The acolytes are trying to get under a their skill levels, say if some one is shooting with a Ballistic skill of 35 they need to roll a 35 to 1 to hit their target. Additionally for each ten points they go over or under their skill they earn degrees of failure or degrees of success. So if the previous shooter rolled a 36, he'd have just barely missed his target, but had he rolled say a 88, not only would he miss, but because he failed by five degrees, he would probably manage to shoot an ally or his own foot instead, at the GM's discretion, ie me. So I'd like to keep a running tally of the goofy and or stupid things that happens to my roving band of acolytes. Now this is a very large group and has grown every session But I'll do my best to stay up to date with who is there. In our first session we had some interesting choices and since the first session was fairly boring save for one of our adepts dueling with a guardsmen and knocking him unconscious in the matter of seconds. First off we had our first Guardsmen played by Kieth, a.k.a. Pontius "Mongrel" Solomon. He was drafted into the imperial Inquisition when the inquisitor these folks are following, Anton "Sasha" Kristoff found him worshiping at an altar of the Chaos God Khorne. He claims to seek and desire salvation. Mathew on the other hand is also a guardsmen, though unlike Kieth (Pontius) who served for a brief time in the Imperial Guard, Mathew a.k.a. Skive is either a slave or a former member of a Penal Legion who contract was purchased by the Inquisitor, we don't know for sure. He's incredibly morbid and sees most of the Imperium and the Inquisition as slavery but maybe he'll change, he has actively admitted that he's willing to sacrifice Pontius if the Emperor's will requires it, and the two of them have already started a gambling ring, mostly betting on duels and combat. He's also the guardsmen who was knocked unconscious by basically a librarian with a stick. Andrew a.k.a. Issha is one of our adepts. He is a former copyist who worked in the service of oppressive masters on a paradise planet. He met the Inquisitor on a hive planet he escaped to after a minor revolt happened on his home planet. He walks a fine line between Heresy and optimism, hoping to achieve equality. However despite his humble beginnings he has already proven to be the move impressive, and luckiest, melee fighter this team has, best three opponents before also knocking Skive out cold. Arron a.k.a. Xomar is our resident Scum, meeting the Inquisitor when he stole from Kristoff. The Inquisitor apparently saw promise in the youth and added him to his retinue instead of simply taking his head off. He seems to have a disturbed obsession with virgins, but that might have been because the majority of his life was spent in under hives and thrones knows what kind of chemicals and mutagens spread down their. He's been mostly sane since the time of questioning. Kyle a.k.a. Xeres Shiv is our assassin, as of writing he's not killed or for that matter hit anything he's shot at. He claims he met the Inquisitor when the man hired him to kill about a dozen people, the success of which is still unknown. He sees his employ by the Inquisition as simply a means to make money and doing what he loves, killing, to get it. Jake, Sa'Argath is our obviously needed, Adeptus Arbites agent. Basically space cops. He claims to have met the Inquisitor during Jury Duty, but what that means is unknown since in many cases Arbites are allowed to function as judge, jury and executioner. Sa'Argath has greedily taken to shouting "I am the Law!" if anyone is crazy enough to challenge him, and he has also become known for his terrifyingly intimidating gaze . Lastly for now Stephanie, Freita is one of the psykers of this motley crew and the only one at the first session. She was hired on by the Inquisitor when the Rogue Trader ship she was on stopped off on a planet. Her sister died in the line of duty as an Arbitrator but she joined the Inquisition to gain some protection for the rest of her remaining family. So there is our basic team and it should be super awesome. They spent most of this session goofing off and doing some tutorial stuff, basically me teaching them to play. Next week will be a full report of a session of goofiness and several falling gates.